Guitars Alive IX featured the Canadian Guitar Quartet on Saturday, April 9th, 2011 at 7:30pm. Participating school guitar ensembles this year were: Larchwood, Chelmsford and Levack Public School Guitar Ensembles; Lively and Lasalle Secondary School Guitar Ensembles, the Lasalle Bluegrass Duo, three guitar ensembles from Cambrian College and this year's featured soloist Jamie Dupuis, a talented guitarist in his 3rd year at Cambrian College. Following an intermission Guitars Alive presented the Canadian Guitar Quartet - featuring a unique program of music, including works by quartet member guitarist/composer Patrick Roux. We thank the Sudbury public for turning out for our main event and we thank our sponsors for their generosity and support: Mike Whalen at Re/Max, Cambrian College, Laurentian University Music, Pat & Mario's restaurant, Prom Music, Joe Natale at RBC Dominion Securities, and Daryl Foreshew, registered massage therapist. The CGQ has often been featured on both English and French national CBC networks, on national broadcasts in Chile, Austria and on a “Classical Guitar Alive” world wide web cast from the United States. In Canada, they have appeared at the National Art Gallery, the Palais Montcalm series, the Glenn Gould Studio in Toronto, with orchestras and in recital across the country. They have performed at the Ottawa International Chamber Music Festival, Lachine Music Festival, Montreal International Classical Guitar Festival, Parry Sound’s “Festival of the Sound”, the Acadia Guitar Festival, Festival Vancouver and the Hornby Island Music Festival. Internationally, they have performed in Brazil, Argentina, Chile and headlined Yale University's "Guitar Extravaganza”, Chile’s “Entre Cuerdas” and “Liliana Perez Corey” festivals, Stetson University’s International Guitar Workshop, the Mississippi Guitar Festival, the Norfolk Chamber Music Festival, and the Guitar Foundation of America festival. The music of Patrick Roux has been performed and recorded all over the world. The Latin inspired rhythms and virtuosity make for drama and excitement, while a constant interchanging of voices among the quartet allow for complex but clear textures and for live panning and stereo effects on stage. In 2002, Les Productions d’Oz began the special "Canadian Guitar Quartet Collection” featuring music by Roux and transcriptions by Denis Donegani and Louis Trépanier. “The music of Patrick Roux is always entirely effective … The result is compelling for its strength, vitality, breadth, and sheer compositional challenge”, wrote Geneviève Chanut in Les cahiers de la guitare (Paris). In 2006, the G8 guitar octet project began with the CGQ joining the Salzburg Guitar Quartet for concerts in Austria and Germany and a national radio broadcast from Innsbruck. G8 continued to delight audiences in Canada in 2007 with a tour that also included a national Radio Canada broadcast on Espace Musique. The CGQ has been featured on a national Bravo! TV special, as well as in the March 2007 issue of England’s Classical Guitar magazine. On December 8, 2007, the CGQ’s New York city debut on the 92nd Street Y’s “Art of the Guitar” series was enthusiastically received with several standing ovations. Wrote Don Witter Jr. of the New York City Classical Guitar Society, “The Canadian Guitar Quartet made one of the greatest New York City Debuts of any artistic ensemble in decades … STUNNING !!!”. 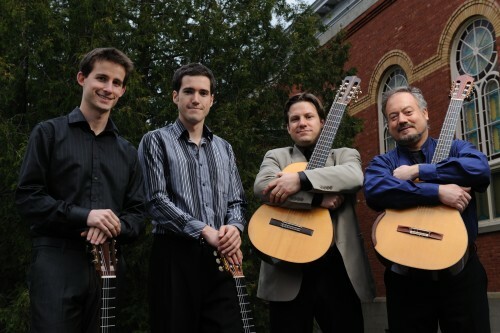 The Canadian Guitar Quartet is currently in residence at the University of Ottawa.